Making a Cigar - The Online Tobacco Seed Store. The bottom third of the plant is called the binder. The top of the plant is the wrapper, which holds the filler under the binder. Once dry, the leaves are stacked into piles. Darker tobacco is stronger, while the lighter-colored leaves smoke milder. The leaves are laid out and flattened. The vein is cut out from the filler leaves and binder leaves. The leaves are stacked into bales, and ought to sit for about a month to complete the aging and drying process. The first step is bunching. 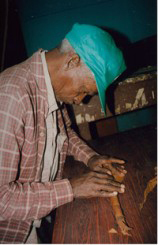 Here, you fold the prepared tobacco leaves by hand to the desired thickness. At this stage, you can blend different types of tobacco together to give the finished product its distinct character and flavour. Once the tobacco is bunched and is as thick as it needs to be, it is rolled into a softer more elastic piece of tobacco called the binder. Its purpose is to hold together the tobacco in the body of the cigar. Once the binder is in place, the body is then pressed in a mold for about two hours to give the cigar its shape. When the body comes out of the mold, it should be a perfect cylinder, and ready for the wrapper. The wrapper is responsible for the cigar’s even appearance and aroma. Fold the end of the wrapper over each end of the cigar and cut to length. Sounds easy? It’s not!! You best watch this video on how it’s really done.